Guard Alarm is used to set a range around your vessel. Whenever a trgetl penetrates your range setting, an alarm is triggered. Collision Alarm is triggered when a targetl meets your alarm criteria. The name of the currently active profile appears in the upper left corner of the plotting screen. HInt:Touch the current profile name to switch to a new one. 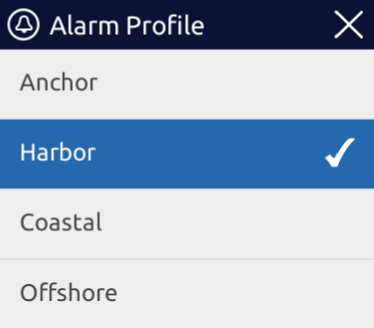 Alternatively, change it using "Select Profile" from the WatchMate Alarms Menu. Then select the profile you wish to activate. Alarm Profiles do not affect your filter settings. These are independent and may be changed, enabled or disabled directly on the plotting screen.